The speeches in the Book of Mormon sometimes contain long quotations from the Old Testament. 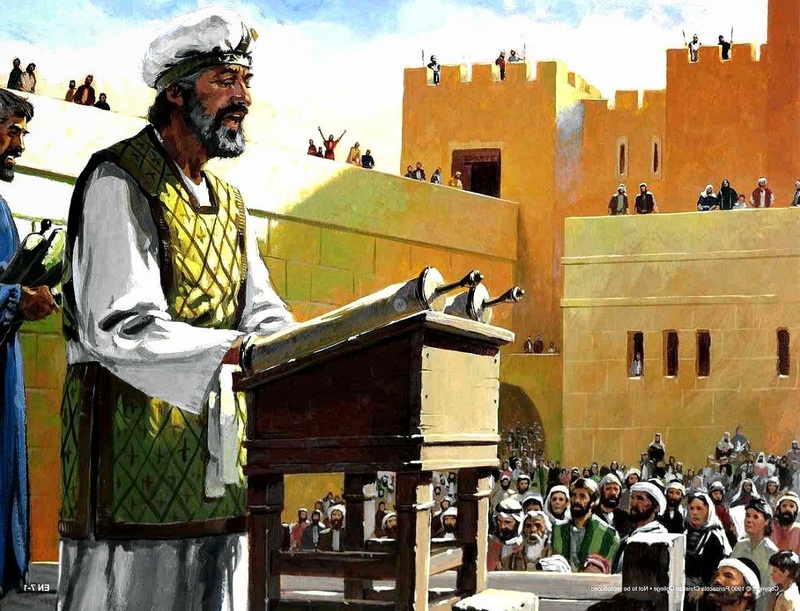 Abinadi quoted much of Isaiah 52 and all of Isaiah 53, Nephi read Isaiah 48–49 from the Plates of Brass (see 1 Nephi 20–21), most of Jacob 5 is a quotation from Zenos, and Jesus quoted large sections from Isaiah, Malachi, and Micah.1 Today, people rarely read long blocks of text out loud to an audience during a speech. But an examination of literacy in the ancient world shows that this was actually a common practice during Book of Mormon times. As Schaper observed, “written texts … provided the basis on which literate Israelites ‘performed’ texts on significant occasions.”5 Schaper has suggested that Nehemiah 8 is a good illustration of this principle.6 Nehemiah 8:1–3 states that all the people gathered together and Ezra “read the Law of Moses to the men and the women, and those that could understand; and the ears of all the people were attentive unto the book of the law.” Deuteronomy 31:11, similarly notes that all Israel (men, women, and children) were commanded to come once every seven years to the house of the Lord to hear the whole book of Deuteronomy "read . . . before all Israel in their hearing." Today, modern people do not gather together to have texts read aloud to them as often as ancient people did.12 But religious gatherings, such as sacrament meetings and General Conference, allow people to gather together to hear scripture being read to them. Sometimes this involves people reading and commenting on verses from ancient or modern scripture, but it involves people reading carefully prepared talks that are like scripture for our day. Gathering together to listen to General Conference or sacrament meeting talks can give us all a sense of what it might have been like in ancient times to gather together to hear the scriptures being read aloud. We were not present to hear Abinadi, Nephi, or Jesus teach about and read from the scriptures, and most of our experience with the scriptures involves reading silently to ourselves. But listening to the speakers in our meetings allows us to be present with them in spirit as we experience, in a small way, what they experienced in ancient times. David B. Honey, “Ecological Nomadism versus Epic Heroism in Ether: Nibley's Works on the Jaredites,” Review of Books on the Book of Mormon 2, no. 1 (1990): 143–163. John A. Tvedtnes, “King Benjamin and the Feast of Tabernacles,” in By Study and Also by Faith: Essays in Honor of Hugh W. Nibley, 2 vols., ed. John M. Lundquist and Stephen D. Ricks (Salt Lake City, UT: Deseret Book and FARMS, 1990), 2:197–237. Hugh Nibley, Lehi in the Desert/The World of the Jaredites/There Were Jaredites, The Collected Works of Hugh Nibley: Volume 5 (Salt Lake City and Provo, UT: Deseret Book and FARMS, 1988), 285–423. 1. See Book of Mormon Central, “Why Did Jesus Mix Together Micah and Isaiah (3 Nephi 20:25),” KnoWhy 214 (October 21, 2016). 2. See Joachim Schaper, “Hebrew Culture at the Interface Between the Written and the Oral,” in Contextualizing Israel’s Sacred Writings: Ancient Literacy, Orality, and Literary Production, ed. Brian Schmidt (Atlanta, GA: Society of Biblical Literature, 2015), 333. 3. Schaper, “Interface Between the Written and the Oral,” 333. 4. Schaper, “Interface Between the Written and the Oral,” 333. 5. Schaper, “Interface Between the Written and the Oral,” 333. 6. Schaper, “Interface Between the Written and the Oral,” 333. 10. For more on oral reading of texts and the Book of Mormon, see David B. Honey, “Ecological Nomadism versus Epic Heroism in Ether: Nibley's Works on the Jaredites,” Review of Books on the Book of Mormon 2, no. 1 (1990): 143–163. See also, Book of Mormon Central, “Why Is The Book of Ether an Epic?” KnoWhy 241 (November 29, 2016). 11. See Book of Mormon Central, “How Might Isaiah 48-49 be “Likened” to Lehi's Family? (1 Nephi 19:23),” KnoWhy 23 (February 1, 2016). 12. For more on gathering together to hear texts read, see Book of Mormon Central, “Why Did the Nephites Stay in Their Tents During King Benjamin’s Speech? (Mosiah 2:6),” KnoWhy 80 (April 18, 2016); Terrence L. Szink and John W. Welch, “An Ancient Israelite Festival Context,” in King Benjamin’s Speech: “That Ye May Learn Wisdom” (Provo, UT: FARMS, 1998), 184; John A. Tvedtnes, “King Benjamin and the Feast of Tabernacles,” in By Study and Also by Faith: Essays in Honor of Hugh W. Nibley, 2 vols., ed. John M. Lundquist and Stephen D. Ricks (Salt Lake City, UT: Deseret Book and FARMS, 1990), 2:197–237.